Google Maps no longer recommends to swim across the Atlantic Ocean if you want to go from the United States to Europe. Google found a better way: "sail across the Pacific Ocean". Google's directions from New York to Paris are quite straightforward: go to Seattle, then swim across Pacific to Hawaii, swim again to Asia where you are directed to drive through Asia and Europe to reach France. After only 519 hours you're supposed to reach the destination. there is also a part where it recommends you to use a jet ski between japan and china! I am sure that will be completely safe and no Chinese aircraft or Japanese will attempt to blow you out of the water. To be fair, sailing and jet-skiing the wrong way round is probably faster than swimming the short route. are these meant to be funny because no one would reasonably be asking for such directions? That's right. 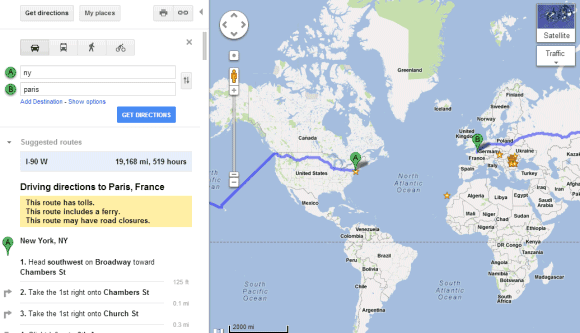 In any case I don't think it's possible to DRIVE to Paris. Google maps also sent me to Texas to reach a street address that was less than a mile away in San Francisco: http://megalomania.me/20121009/google-maps-sent-me-to-texas/. I would love someone to actually test out how accurate these directions are and there timings. So why do they never tell me to drive to the airport and catch a plane? Walking directions from Milan to Rome are also pretty funny.